Annette Sykora: E-contracting speeds up deals. SAN FRANCISCO -- Dealers attending the National Automobile Dealers Association convention here last week said they are fine-tuning their finance and insurance operations for maximum profit as showroom traffic rises. Some said they're adopting e-contracting. The process will allow dealers to get paid for the transaction quicker, but that's not all that's behind the move. 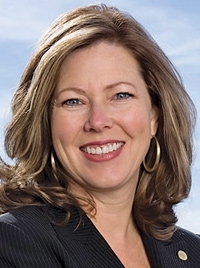 Levelland, Texas, dealer Annette Sykora, a former NADA chairman, says the speedier transaction will appeal to customers. She notes that a common complaint at dealerships is the long wait in the F&I office. -- Early greeting: Sykora, who is dealer principal of Smith South Plains (Ford, Lincoln, Dodge, Chrysler, Jeep, Ram), has salespeople introduce the F&I manager early in the process. Sykora wants sales and finance to work as a team and for the process to be seamless -- not an abrupt handoff to the F&I office. The goal is to time the introduction to just after the customer says "yes" to the vehicle purchase. -- Posted rates: Washington, D.C.-area megadealer Jack Fitzgerald posts the lowest available interest rate on a car loan on his Web site and in his showrooms. Fitzmall.com, for example, says: "Today's Low Interest Rate 4.89% APR. Today's Low Manufacturer Interest Rate 0.00%" in the upper right corner of the home page. The rates also are posted on a large sandwich board in the showroom, just as a bank would do in its lobby. -- Plasma TVs: Jeremy Alicandri, executive vice president of Habberstad Auto Group, a four-store group in New York, has installed large plasma TV screens in the F&I office. He has created a PowerPoint presentation to help finance managers sell the company's product menu. -- Extended high-mileage warranty: Demere NeSmith, a Chevrolet dealer in Claxton, Ga., has started offering extended service plans on used vehicles with up to 250,000 miles on them to accommodate the high-mileage used vehicles he's selling. -- YouTube: NeSmith, who already has made use of video on his Web site, also intends to promote F&I products on video on his site and on YouTube. -- iPad: Ash Zaki, COO of Mercedes-Benz of San Francisco, is using an iPad equipped with Mercedes-Benz Financial Services' Advantage software to speed lease turn-in and sell F&I products. The iPad allows the finance manager to leave the office and sell products while showing off the vehicle.